Can You See Me Now? Good! I believe that hunters have a specific gene that accounts for many of the manias we suffer. Whether its our gun obsession, hand or electronic calls obsession or our obsession with tracking, stalking and taking game animals, I think they can all be attributed to the Hunter gene. This may be the only explanation as to why we spend millions of dollars a year on camouflage clothing, guns and accessories. Theres just something that tickles the hunter gene when we watch someone walk out into the wild, sit down and disappear. We all experienced it while watching the movie adaptation of Tom Clancys book Clear and Present Danger You all know the scene Im talking about. 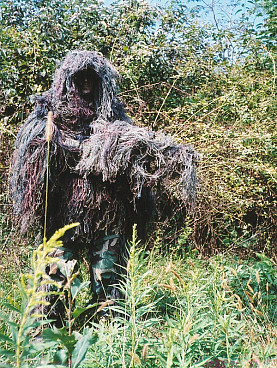 Each of us had one of those Ive gotta get me one of those moments when PFC Chavez popped out of the brush in his ghillie suit a mere 10 feet from the men looking for him. 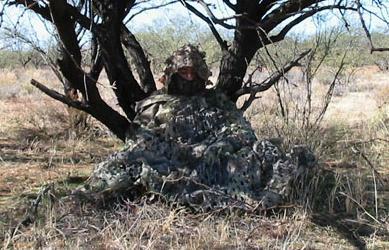 But when were hunting predators, how much camo is too much camo? There has been a long running debate over the ability of dogs (including foxes and coyotes) to see color. Some hypothesize that dogs can only see in black and white and shades of gray. If that is true, then why isnt all hunting camo black, white and shades of gray? "Vision is just one of several senses that dogs use to scan their world for important information. Any visual scene has multiple aspects to which dogs brains are sensitive: brightness, shape, contrast, and motion are a few of these. But what about color? Dr. Vaughan played a role in this well-known study of color vision in dogs published by J. Neitz, T. Geist, and G.S. Jacobs (1989), "Color vision in the dog", Visual Neuroscience Vol. 3, pages 119-125. The complete article may be found by clicking HERE. As a result of this study, it was found that dogs indeed lack the same color vision as humans. Humans have three types of color receptors in their eyes. Each color receptor picks up a small portion of the visible light spectrum. Dogs were found to have only two of these three types of color receptors in their eyes. This means that while dogs do see color, they are only able to differentiate a limited number of colors. This is very similar to a human who is colorblind. They are unable to differentiate between certain colors or shades. These experiments showed that dogs do see color, but in a more limited range than that seen by normal humans, who see the rainbow of colors described by "VIBGYOR": Violet, Indigo, Blue, Green, Yellow, Orange, and Red (plus hundreds of variations on these shades). Don't believe me? Click on the button to view how dogs may view the world. 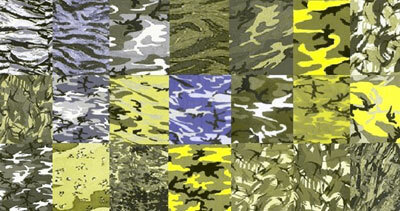 This is a chart of various camouflage patterns and colors. Notice how the orange and red patterns take on the same hue as the tan and brown colors in the other patterns. In the pictures below, notice how dramatically the bluejeans stand out. I also found in interesting that the light green brush in the background looks the same as the grass in the foreground in the filtered picture. So, What does this mean to the average hunter? Probably not much since we tend to buy what we feel looks "really cool" as much as what is functional. What this does mean is that we don't necessarily need to be so picky about the exact color of our camo. It is also a great argument in favor of using hunter orange to prevent hunting accidents. Since dogs (and probably deer as well) can't distinguish between orange, green and yellow, you can very easily get away with blaze orange gear because it will blend into all of the other greens and browns in the environment. 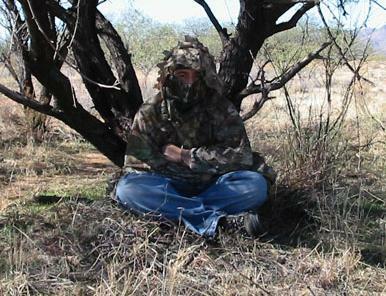 As Dr. Vaughan stated, there are more elements to a dogs/coyotes ability to detect a hunter in the wild. While color can play a factor, it is most likely not the most critical factor in going unnoticed in the field. We'll examine those other factors in other articles. In the meantime, stay upwind and don't move.